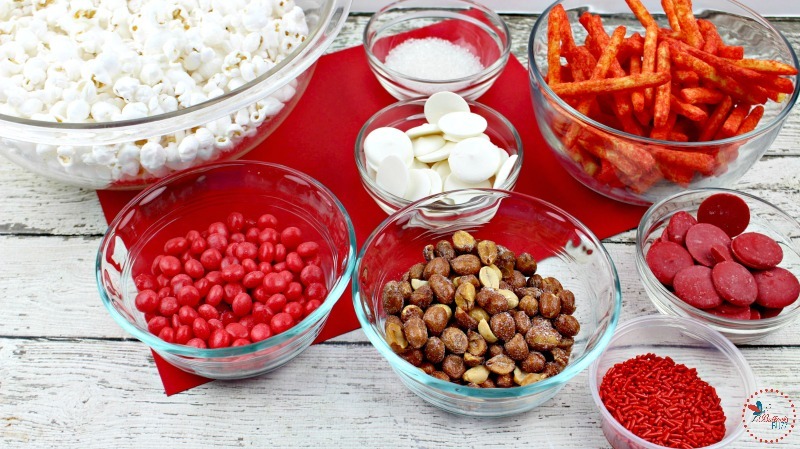 Add a little spice to the sweetest day of the year with this deliciously spicy-n-sweet Flamin’ Hot Valentine’s Day Popcorn recipe. 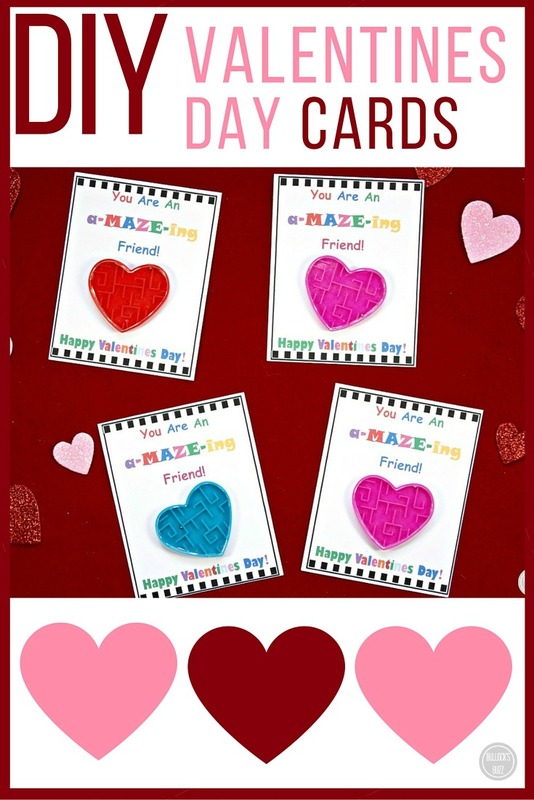 Valentine’s Day is right around the corner! 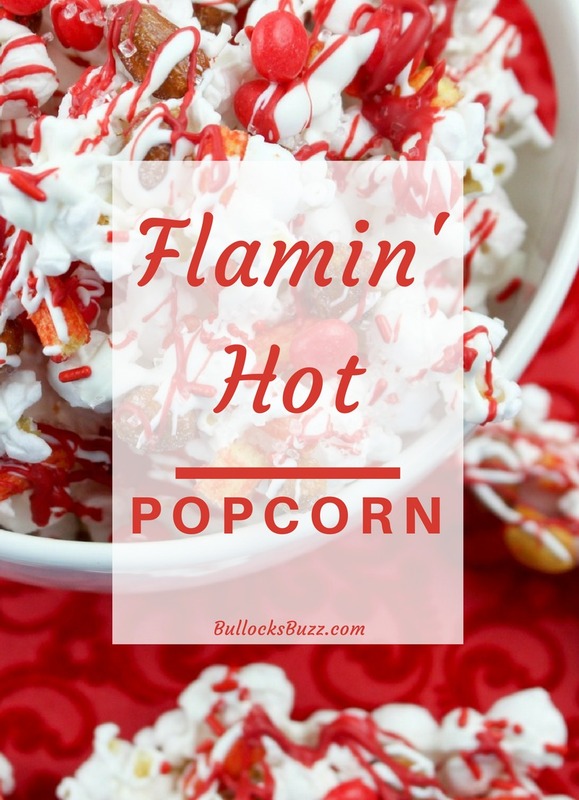 And for all of you who “heart” popcorn as much as I do, I have the perfect quick and easy snack for you — Flamin’ Hot Valentine’s Day Popcorn! This Flamin’ Hot Popcorn recipe takes the much-loved Red Hots popcorn recipe to a whole new level with the addition of spicy peanuts and Flamin’ Hot Fries. Meanwhile, melted chocolate and cinnamon candies add just the right amount of sweet. It’s guaranteed to add a little spice to your Valentine’s Day. Making this Flamin’ Hot Valentine’s Day Popcorn is pretty straight forward. And best of all it’s quick, easy and inexpensive. TIP: Did you know there’s an easier way to melt candy melts? Forget using the microwave and dirtying multiple bowls. A candy melting pot is so awesome to have in the house, you won’t believe how easy it is to QUICKLY melt candy and make LESS of a mess! After thinking about it for over a year, I finally bought one and I’m so happy I did – it melts the candy perfectly. The one I have is a best seller and so inexpensive it’s worth getting to keep in your kitchen. 1. Line a large baking sheet with parchment paper. Lay the popcorn on the baking sheet, in a single layer. Set aside. 2. Cut the flaming hot fries into small bite-size pieces. Sprinkle on top of the popcorn. 3. Add the peanuts to the popcorn mixture. 4. Sprinkle cinnamon red hots on top and set aside. 5. In a microwave safe bowl, add the white chocolate chips. Microwave for 45 seconds. Remove from the microwave and stir until melted and smooth. 6. Drizzle the melted white chocolate all over the popcorn. Before the chocolate hardens, drizzle the red jimmies on top of the white chocolate. 7. Add the red chocolate chips to a microwave safe bowl and microwave for 45 seconds. Stir until completely melted and smooth. 8. 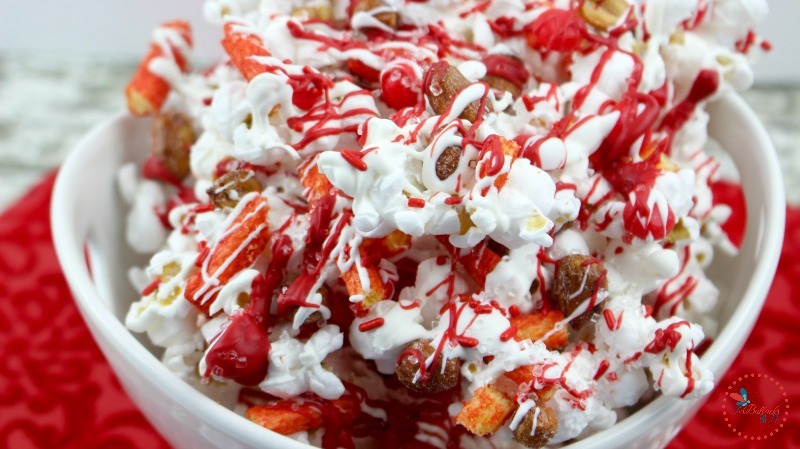 Drizzle the melted red chocolate on the popcorn. Before the chocolate hardens, sprinkle the white sugar crystals on the white chocolate. 9. Place in the refrigerator and chill for approximately 10 minutes to allow the chocolates to harden. 10. Remove from refrigerator and break up into pieces. Flamin’ Hot Valentine’s Day Popcorn can be stored in an airtight container for up to 1 month. And there you have it. Flamin’ Hot Valentine’s Day Popcorn! Package it in little tins to gift to your friends, or serve it up at your child’s classroom party. It’s sure to be a “hot” treat! Don’t miss the handy-dandy printable version of this recipe below. I hope you “love” this Flamin’ Hot Valentine’s Day Popcorn as much as I enjoyed making it! If you make this recipe, be sure to snap a photo and hashtag it #BULLOCKSBUZZ.  I’d love to see what you cook! 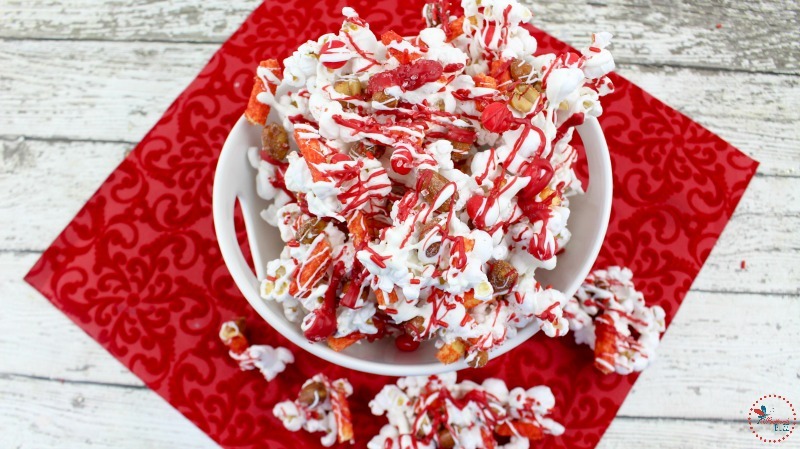 Add a little spice to the sweetest day of the year with this deliciously sweet-n-spicy Flamin' Hot Valentine's Day Popcorn recipe. Line a large baking sheet with parchment paper. Lay the popcorn on the baking sheet, in a single layer. Set aside. Cut the flaming hot fries into small bite-size pieces. Sprinkle on top of the popcorn. Add the peanuts to the popcorn mixture. Sprinkle cinnamon red hots on top and set aside. In a microwave safe bowl, add the white chocolate chips. Microwave for 45 seconds. Remove from the microwave and stir until melted and smooth. Drizzle the melted white chocolate all over the popcorn. Before the chocolate hardens, drizzle the red jimmies on top of the white chocolate. Add the red chocolate chips to a microwave safe bowl and microwave for 45 seconds. Stir until completely melted and smooth. 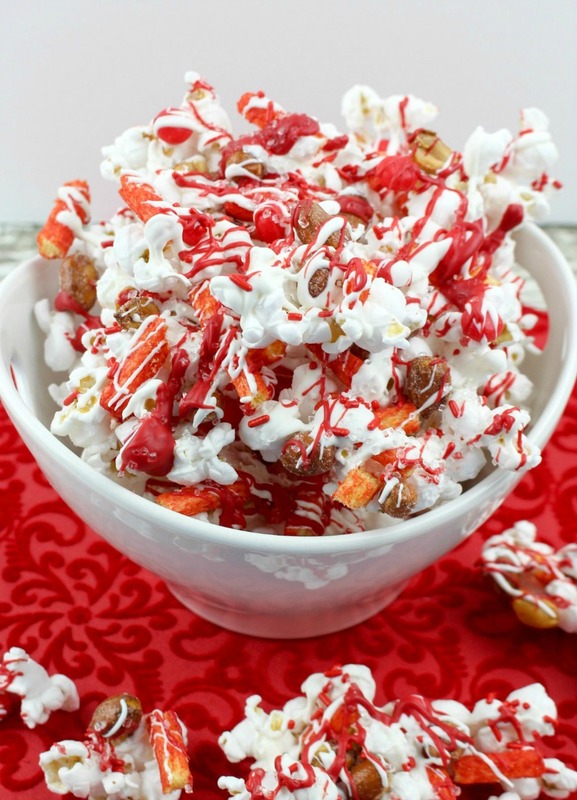 Drizzle the melted red chocolate on the popcorn. Before the chocolate hardens, sprinkle the white sugar crystals on the white chocolate. Place in the refrigerator and chill for approximately 10 minutes to allow the chocolates to harden. This Flamin' Hot Popcorn can be stored in an airtight container for up to 1 month. The 10 minute cook time is actually the amount of time you place it in the fridge to allow the melted chocolate to harden. Other easy Valentine’s recipes and treats you may enjoy. 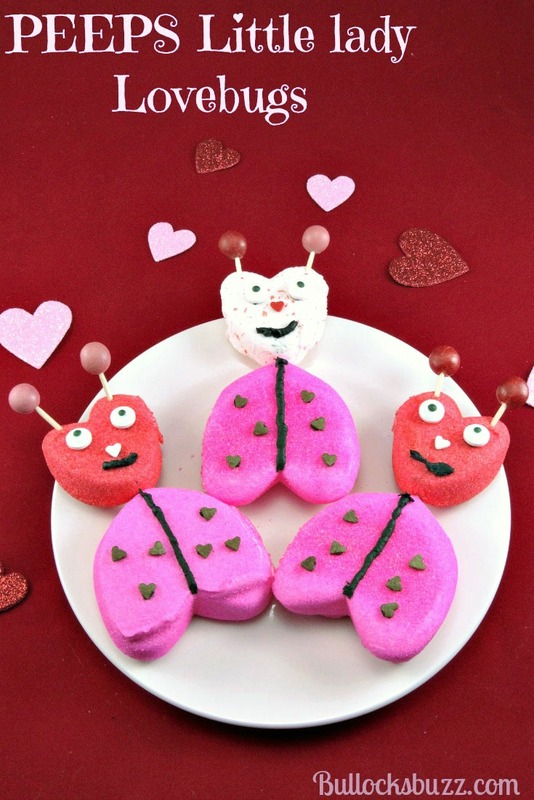 Do you have a favorite Valentine’s Day recipe or craft? I’d love to hear about it! Share with us in the comments below!